There are many ways in which you may donate your time to PRNA. Love animals? Try the Animal Services Center! Love Events? Volunteer at the Winter Festival! Want to clean up the neighborhood? Be a part of our Volunteer in Parks Program! There are a great deal of opportunities out there in which YOU can make your community even better! Please be advised that individuals must pass a background screening in order to volunteer with PRNA. The Animal Service Center Volunteer Program is vital to their operation, and volunteers are making a big impact in many ways. Volunteers assist in the care of the dogs and cats housed in the shelter, they provide support for special events and administrative programs, they open their homes and hearts to animals needing a little extra care in a foster home, and they even assist the veterinary team with the surgery program. Learn more about the Animal Service Center Volunteer Program (like to ASC Volunteer page) today! This program was created to help give teenagers that are too old for our camp, their first "real job-like" experience. Working with full-time staff and our camp staff, the teenagers will help implement our successful summer programs. Hopefully this training will allow teenagers to prepare for future job opportunities both with our camp and with others. Applications for teenagers wishing to join our team must be submitted to center staff no later than Feb. 28th of each year. (Leap year deadlines are extended to the Feb. 29th) Participants will then go thru an interview process with our camp director. Teenagers selected must then pass a Level 2 background check before the summer starts. For more information, contact staff at 891-3946 for Sue McCollum Community Center or 891-3856 for Summer Playgrounds. Our volunteers help us in so many ways. To list just a few: Greeters welcome guests and new members. Volunteers help with our M-F salad bar and with other programs at the center and at 14 neighborhood sites. Administrative assistants assist with data entry, class check-ins, mail outs, special events, building maintenance and gardening, and much more. Our volunteers help us in so many ways. To list just a few: facilitate programs, greet guests, serve as receptionist and welcome new members. Volunteers help in many aspects at the center and at 14 neighborhood sites. Administrative tasks may include data entry, class check-ins, mail outs, special events, building maintenance and gardening, and much more. We offer flexible schedules. Contact Volunteer and Participants Coordinators: Gena Varn at 891-4005 or Addie Carroll-Beal at 891-4009. Anyone interested in volunteering at the Winter Festival should contact Allison Behrman at 891-3885. All other volunteers hoping to work on other special events should contact Mario Palmentieri at 891-3879. Opportunities are available for Flag and Tackle Football, Cheerleading, Volleyball, Basketball, Soccer, Baseball, Softball. Please contact our Athletics Division staff at 891-3866. The City of Tallahassee Parks, Recreation and Neighborhood Affairs Department (PRNA) has launched a park volunteer program, known as Volunteers In Parks or "VIP". With the diversity of projects, tasks and programs that PRNA oversees, there is no limit to the volunteer opportunities, no matter what a person's skill set, trade or interests. 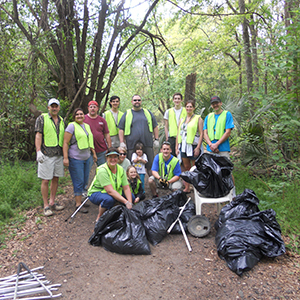 Volunteers are needed who can provide maintenance assistance in the form of general clean-up, such as picking up litter, painting, weeding and minor planting; provide direct monetary assistance for facility enhancements; look out for vandalism and maintenance issues and report such items to the department, and provide input to the Department on park development and programs. The VIP program is a great opportunity for community organizations, businesses, neighborhood associations and individuals to become directly involved in improving our parks, landscaped areas, greenways and recreational facilities to help build community spirit and a sense of civic responsibility. PRNA staff will assist with available resources to provide training and supervise the progress of the work of each individual or group. By supplementing City resources, the VIP program will enhance the condition of and help beautify our parks, recreational areas and open space in neighborhoods throughout Tallahassee and will help improve the quality of life for our entire community. If you are interested in learning more about this fulfilling opportunity, please download and complete the application (PDF), or contact Chris Lisenby at 891-5176. A background check will be completed prior to approval. The Athletics division is seeking motivated and energetic individuals who are interested in becoming umpires/officials for both adult and youth sports. Officials are needed for the following sports: Flag Football, Volleyball, Basketball, Soccer, Baseball and Softball. For more information call 891-3837 or 891-3825. In partnership with the American Red Cross, the Aquatics Division offers lifeguard training courses for those interested in protecting the safety of swimmers. Trousdell Gymnastics Center is always accepting applications for gymnastic competitive and recreational level coaches with experience. Apply in person at the center, 326 John Knox Road, after 1:00pm weekdays.